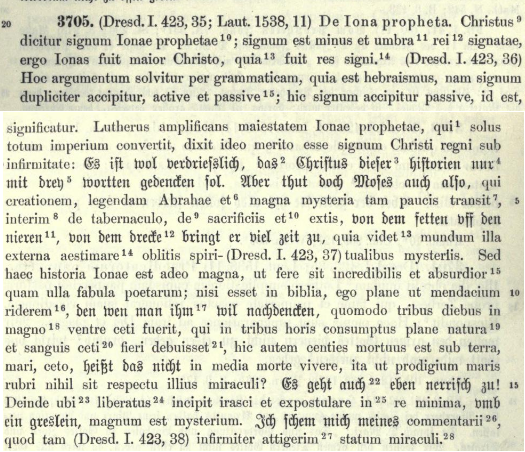 Allegedly Luther stated, "The history of Jonah is so monstrous that it is absolutely incredible ... " What are the implications of this brief snippet? Did Luther deny the historical account of Jonah and the whale? Did he deny the miraculous? Was he like a liberal scholar interpreting the Bible as fictional literature rather than history? Was Luther simply saying awful things about Holy Scripture? This has been a favorite Luther quote for Rome's defenders. This version of the quote came from a person who was "moving beyond being a life-long Mormon into full communion with the Body of Christ, which is His Church." By "His Church," Rome is meant. Elsewhere in cyberspace, this defender of Rome uses a version of the quote as an example of "Luther's Narcissism." 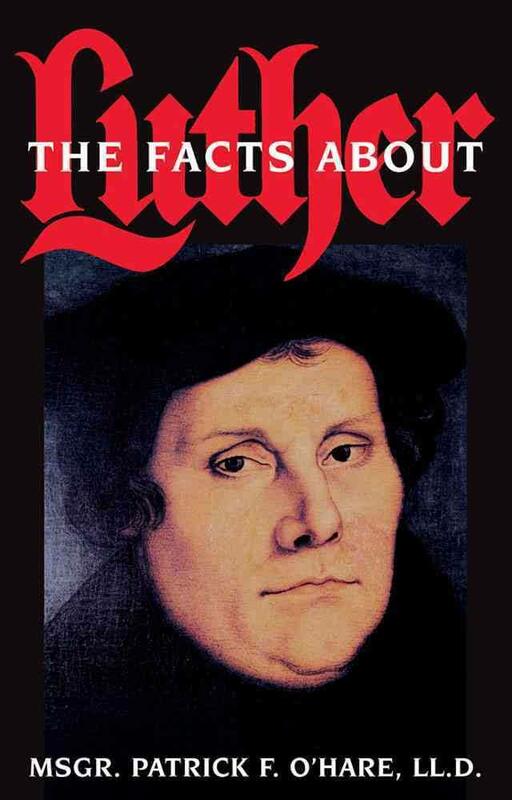 This online Roman Catholic periodical uses it to imply Luther was "an enemy of the Bible." The quote also made it's way on to Luther, Exposing the Myth. Examples could easily be multiplied. We'll see there's a case to be made that Luther wasn't a narcissist or an enemy of the Bible, but is rather being mis-cited from a less than reliable secondary source. O'Hare does not say where he took this material from (his documentation is often sketchy), and many of Rome's modern cyber-defenders do not care to do any research as to where the quote comes from. There were a number of English sources previous to O'Hare that present versions of this quote. One of the closest English translations I found previous to O'Hare is from an 1865 work: "The history of Jonah is so monstrous that it is absolutely incredible" [link]. I mention this source because there are striking similarities with it and some of O'Hare's other Luther quotes. The author cites "Edinburgh Review, No. 121" which refers to an article from 1834 entitled, On The Right Of Dissenters To Admission Into The English Universities. This appears to be the main source from which all the English translations of the quote stem from. This article was put together by Sir William Hamilton. Hamilton was not a Roman Catholic theologian but rather a Scottish philosopher and academic. The article has to do with the issue of whether or not those with dissenting religious views should be allowed into universities and compelled to follow the religious views of the English universities. A number of Luther's statements are brought up to demonstrate that Luther's views would dissent against alleged contemporary Lutheran orthodoxy. Hamilton states, "We can easily show... there is hardly an obnoxious doctrine to be found among the modern Lutherans, which has not its warrant and example in the writings of Luther himself." Hamilton then provides a "hasty anthology of some of Luther's opinions." He provides a few pages of Luther citations broken down into categories. Under the heading of "Biblical Criticism" he quotes Luther saying, "The history of Jonah is so monstrous that it is absolutely incredible" [link]. On the book of Jonah the Reviewer makes Luther say, "The history of Jonah is so monstrous, that it is absolutely incredible." Verily the misrepresentation in these words is so monstrous as to be almost incredible. True, Luther is represented in the Tabletalk as saying those words; and he goes on thus (p. 2096): "yea, it sounds like a lie, and more extravagant than any fable of the poets; and if it did not stand in the Bible, I should laugh at it as a lie. For if one thinks about him, how he was three days in the great belly of the fish, where in three hours he might have been digested and turned into the substance of the fish: here he might have died a hundred times, under the earth, in the sea, in the fish... Is not this to live in the midst of death? so that beside this miracle that in the Red Sea is nothing. And how oddly it turns out. After he is delivered and saved, he begins to rage and to grumble and to vex himself for the sake of a little thing, namely, a herb. It is a great mystery: I am ashamed of my interpretation of this prophet, that I have treated the main action and purpose of the miracle so weakly." So that the greatness of the miracle, instead of making Luther doubt its truth, as the Reviewer by his shamefully garbled quotation accuses him of doing, is merely magnified by Luther to shew the fulness of his faith in it [link]. I quoted these words of Luther to show in how irreverent a manner he thought himself privileged to speak of the Holy Scriptures. Mr. Hare is of a different opinion, which he is entitled to hold, if de gustibus rum est disputandum. But in his translation of the relative context (here as elsewhere), he certainly has no right to make Luther speak as he would wish him to have spoken, far less to found on what he gives as Luther's, and not on Luther's veritable expressions. But this he does; and doing this while he ostensibly defends, he really gives up the Reformer as indefensible. Only, he ought, in candor, to have said so, instead of saying the reverse. For example: Luther, in reference to the history of Jonah, says: "Es gehei auch eben naerrisch zu" ("It passes, moreover, even into the foolish.") This Mr. Hare renders by—"And how oddly it turns out." Fidus interpres! [link]. This text was not translated into English in LW 54. However, an English translations was provided in William Hazlitt's edition of the Table Talk. The context does not demonstrate that Luther was being harsh towards the book of Jonah. Being swallowed by a giant fish and surviving in the way the Bible recounts does seem monstrous, absolutely incredible, and even foolish. This is why in the same context Luther is said to have said, "if it were not in the Bible, I should take it for a lie." Hamilton states he cited the sentence under scrutiny to demonstrate "how irreverent a manner he thought himself privileged to speak of the Holy Scriptures." Notice though how the utterance ends, "It is a great mystery. I am ashamed of my exposition upon this prophet, in that I so weakly touch the main point of this wonderful miracle." This is not the heart of irreverence, but the heart of faith. Even when rightly Hamilton chastises Hare for his rendering of "Es geht auch eben närrisch zu," this is another demonstration that Hamilton missed the obvious in the context. Here's an extended section from a lecture given by Luther as noted by Roland Bainton in his famous biography, Here I Stand (pages 355-357). I do this so if any come across this quote, or actually thinks the defenders of Rome have a cogent argument against Luther, this serves as a defense to show how Luther actually dealt with the book of Jonah. He treats the book with respect, and treats the book as history. According to Luther, because it is in Scripture, it can be believed. Jonah was sent to rebuke the mighty king of Assyria. That took courage. If we had been there, we should have thought it silly that one single man should attack such an empire. How silly it would seem for one of us to go on such a mission to the Turks. And how ridiculous often it has appeared that a single man should rebuke the pope. But God's work always appears as folly. "And Jonah took ship for Tarshish." The godless think they can get away from God by going to a town where he is not recognized. Why did Jonah refuse? First because the assignment was very great. No prophet had ever been chosen to go to the heathen. Another reason was that he felt the enmity of Nineveh. He thought God was only the God of the Jews, and he would rather be dead than proclaim the grace of God to the heathen. Then God sent a great wind. Why should he have involved the other passengers in Jonah's punishment? We are not the ones to lay down rules for God, and for that matter the other persons on the boat were not innocent. We have all transgressed. The storm must have been very sudden because the people felt that it must have an unusual cause. Natural reason taught the sailors that God is God. The light of reason is a great light, but it fails in that it is ready to believe that God is God, but not to believe that God is God to you. These people called on God. This proves that they believed he was God, that is to others, but they did not really believe he would help them, otherwise they would not have thrown Jonah overboard. They did their uttermost to save the ship like the papists who try to be saved by works. Jonah was asleep in the hold. Men are like that when they have sinned. They feel no compunction. If God had forgotten his sin, Jonah would never have given it another thought. But when he was awakened and saw the state of the ship he recognized his guilt. His conscience became active. Then he felt the sting of death and the anger of God. Not only the ship but the whole world was too small for him. He admitted his fault and cleared all the others. This is what contrition does. It makes all the world innocent and yourself only a sinner. But Jonah was not yet ready to make a public acknowledgment. He let the sailors wrestle until God made it plain that they would all perish with him. No one would confess. They had to cast lots. Wounds cannot be healed until they are revealed, and sins cannot be forgiven until they are confessed. Some say that they sinned in casting lots, but I cannot see that lot-casting is forbidden in Scripture. Then Jonah said, "I am a Hebrew. I fear the God who made heaven and earth." The weight of sin and conscience is made greater if confessed. Then faith begins to burn, albeit weakly. When God's wrath overtakes us there are always two things, sin and anxiety. Some allow the sin to stand and center on the anxiety. That won't do. Reason does this when faith and grace are not present. Jonah confessed his sin to be all the greater when he said, "I am a Hebrew and a worshiper of the true God." This made him all the more inexcusable. And Jonah said, "Throw me into the sea." The sailors thought confession was enough, and they set to work again on the oars. Jonah had to plumb the shame which was a thousand times greater because it was against God. For such a one there is no corner into which he may creep, no, not even in hell. He did not foresee his deliverance. God takes all honor and all comfort away and leaves only shame and desolation. Then came death, for the sting of death is sin. Jonah pronounced his own sentence, "Throw me into the sea." We must always remember that Jonah could not see to the end. He saw only death, death, death. The worst of it was that this death was due to God's anger. It would not be so bad to die as a martyr, but when death is a punishment it is truly horrible. Who does not tremble before death, even though he does not feel the wrath of God? But if there be also sin and conscience, who can endure shame before God and the world? What a struggle must have taken place in Jonah's heart. He must have sweat blood. He had to fight against sin, against his own conscience, the feeling of his heart, against death, and against God's anger all at once. As if the sea were not enough, God prepared a great fish. As the monster opened its frightful jaws, the teeth were jagged like mountain peaks. The waves rushed in and swept Jonah into the belly. What a picture is this of Anfechtung. Just so the conscience wilts before the wrath of God, death, hell, and damnation. "And Jonah was three days and three nights in the belly of the whale." Those were the longest three days and three nights that ever happened under the sun. His lungs and liver pounded. He would hardly have looked around to see his habitation. He was thinking, "When, when, when will this end?" How could anyone imagine that a man could be three days and three nights in the belly of a fish without light, without food, absolutely alone, and come out alive? Who would not take this for a fairy tale if it were not in Scripture? But God is even in hell. "And Jonah prayed unto the Lord from the belly of the whale." I do not believe he could compose such a fine psalm while he was down there, but this shows what he was thinking. He was not expecting his salvation. He thought he must die, yet he prayed, "I cried by reason of mine affliction unto the Lord." This shows that we must always pray to God. If you can just cry, your agony is over. Hell is not hell any more if you can cry to God. But no one can believe how hard this is. We can understand wailing, trembling, sighing, doubting, but to cry out, this is what we cannot do. Conscience, sin, and the wrath of God are about our necks. Nature cannot cry out. When Jonah reached the point that he could cry, he had won. Cry unto the Lord in your anguish, and it will be milder. Just cry and nothing else. He does not ask about your merit. Reason does not understand this, and always wants to bring in something to placate God. But there just is nothing to bring. Reason does not believe that all that is needed to quiet God's anger is a cry. "All thy waves and thy billows are gone over me." Observe that Jonah calls them thy waves. If a wind-blown leaf can affright a host, what must not the sea have done to Jonah? And what will not the majesty of God at the judgment day do to all angels and all creatures? "My soul melted within me, and I thought of the Lord." This is to turn from the God of judgment to God the Father. But this does not lie in the power of man. "I will sacrifice unto thee with the voice of thanksgiving, I will pay that I had vowed." "And the Lord spake unto the fish, and it cast Jonah forth upon the dry land." The instrument of death is become the agency of life. I understand the protestant need to defend Luther. After all, one can't easily simply divorce a movement from its founder. But is it really worth defending the indefensible? If Protestants kept a list of saints I'm not sure that Luther would be making the grade. There's only so far you can go in excusing this Luther fellow. Subtle arguments about the context of what he said or excuses that he was half inebriated in some German beer hall can only go so far before we must question the sanity of following a movement that he started. You obviously must be new to my blog- most of the quotes you posted have already been discussed. I've never wanted to make Luther a "saint"- in fact, I will be the first to admit he was a sinner, and proved himself so by either his actions or something he said. That being said, people like you tend to try to make him worse than he was, which is sinful slander. You've never read the contexts of the quotes you provided- I am very aquainted with people like you who perpetuate misinformation and slander- it is truly sad, but, it proves you are not anywhere near sainthood, that's for sure. Repent! If you think they are defensible, put up a web page that responds to them all and let's see what it looks like. I don't find fossicking through years of blog articles to be a practical thing. Wow, amazing response! You sound like an utter fool, with the complete lack of ability to go do some work for yourself - even though James has done almost all the work for you already, and provided bucket loads of refutations on this site concerning your pot shot Luther quotes. "I don't find fossicking through years of blog articles to be a practical thing." but James gathering all the information for you in a neat little package would be practical for someone else? Whethere you realize it or not, your posts here reveal alot about yourself, and I must say, I am not impressed in the least and on top of that quite disappointed with the substance of your posts. You need to step back and evaluate your apologetic approach and rethink some things. Your quotes on Luther demonstrate complete ignorance on the subject and you should first learn to listen and then speak since your knowledge about Luther seems to get no further tnan Internet rumors. My goodness, you don't think you have any responsibility to know the context of a quote before using it to "prove" someone is beyond excusing? You'll have to do a copy-and-paste instead of just clicking on a link. I weep for the impracticality. So I take it Luther doesn't deserve an actual web page in his defence. Well you got that right I think. So I looked up a random selection of them and at least half have no response at all, at least as far as the search engine can provide. Of the ones that do have a response they seem to fall into the categories of "he can't have really meant that because he was prone to hyperbole", or "surely he didn't really say that" or "that's probably a misquote". As I said, we might excuse one or two as the stupid remarks of someone with too many Steinlagers after dinner, but there's got to be a limit before we say enough is enough, why listen to this man? I don't see anything in the contexts that actually changes the meaning of what he says. What we are supposed to accept is that because Luther wanted to make one particular point, it gives him free reign to spout heresy on another point because it is just "hyperbole". Sorry, but it's just too much sophistry. Luther promotes ignoring the moral code, encourages various sins, denies the sinlessness of Christ, denies the evangelical nature of scripture, promotes murder of Jews and peasants and denies reason. And for those who aren't impressed with my posts, stop using your reason because it is the enemy of the faith. At least Luther says so. Oh yeah, and allow me hyperbole and all the other excuses Luther apparently gets. When I say something more ridiculous than all of these quotes, then you'll have something to whine about. In the mean time grow some consistency. Comments like those you offer make me question why I actually allow comments on this blog. I know that's mean, but I am speaking exactly how I feel. Don't expect me to jump through any of your hoops. I've done the research and I still do the research. If you want to simply read second-hand comments from Luther without checking contexts, please leave this blog, go over to cor ad cor loquitur. You would be among people who probably respect your opinion, and also value your type of research methods. He's your founding father, why don't you defend everything he says, if he is worth defending? If he is not worth defending, toss him into the Elbe and be done. But what little you've done so far falls far short of making him come up rosy. You've provided a lot of contexts and it hasn't helped him. It's no use whining about context unless context vindicates him, but it hasn't. Take your response to Luther's saying that Christ sinned. No response other than to say that he can't have really meant that. Well who knows when he means what he means and when he doesn't? That's not a response. We can put it in the bucket of giving the fellow a few free rides, but there is only so many free rides we can grant. Maybe he meant nothing at all that he said and he was really a great chap. But does it really make sense to you that the prophet God would send to reform the church would be someone who goes on record to say kill Jews and peasants, Christ was a sinner, guard yourself against good works? That doesn't sound like the God I know. Why do I got the feeling that your an amateur Luther-researcher? Your neophyte one-liners give me the creeps, if thats the depth of your understanding of Luther. I have been here on this web-site long enough to know that context will solve most of your problems! Common do your homework, its good for you. If context solves all, give me a demonstration and show me, to take one example, that Luther is vindicated in saying to kill peasants, mercy be damned. This quote is being pulled from the online document, "Luther Exposing the Myth" (note the references and footnote). I began reviewing this webpage here. I contacted the author as well, and was told he would take a look at my reviews and get back to me, and he never did. The documentation provided from Luther Exposing the Myth states, "Martin Luther 'The Facts About Luther, TAN Books, 1987, p. 290. Grisar, “Luther”, Vol. V. pg. 413." At the time I wrote my paper on Luther and the Jews, I did not have a copy of Grisar, Luther Vol. 5. "The fact is, however, that no increase in the number of conversions took place. This disappointing experience, the sight of the growing insolence of the Jews, their pride and usury, not to speak of personal motives, such as certain attempts he suspected them to have made on his life at the instigation of the Papists, brought about a complete change in Luther s opinions in the course of a few years. As early as 1531 or 1532, when a Hebrew baptised at Wittenberg had brought discredit upon him by relapsing into Judaism, he gave vent to the angry threat, that, should he find another pious Jew to baptise he would take him to the bridge over the Elbe, hang a stone round his neck and push him over with the words : I baptise thee in the name of Abraham; for " those scoundrels," so he adds, " scoff at us all and at our religion." I have not heard this particular story before. At face value, the quote is more likely strong angry hyperbole than an actual threat. Grisar often missed this in Luther's writings. Also note, this quote from Grisar is said to be from the early 1530's, while the quotes I posted in my paper are from a later date. Whether Luther would ever really have thrown a Jew off a bridge is quite beside the point. If Jesus had come along saying to throw all the Samaratins in the river would he make a compelling prophet for a new religious movement? Even if he wasn't prepared to do it in real life? I think not. Loose lips sink big ships and we know what happened to the Jews in Germany later on. Things tend to progress from talk to reality, even if not in the original speaker. As shown in this quotation and thus in many others too, the isolated and context-less quotations of Luther thus leads one to paint a Luther-less persona of the man. This made-up picture of him is actually not him! Thus, in the interest of truth, we must penetrate through all the imagined myth and try to find the real and historical Martin Luther. That should be reasonable goal for everyone interested in this field of study. Luther properly baptized a truly converted Jew and that Jew became a Christian. No doubt that that really happened. The Table Talk Collection speaks of an answer to a question which in context is an unconverted Jewish scoffer asking for baptistm and the answer was liberally spiced with humor. Probably the everyone there understood the humor of it and at that time nobody had in mind a Jew-hating Martin Luther. That should be clear enough. Humorous hmm. I wonder what the punchline was. Yes we can all imagine Luther and his fans gathered around with plentiful Steinlager, tossing around foolish talk and banter. It doeesn't make him a monster, but it does make him non-prophet material. As I said, not a compelling choice for God renew the teachings of Jesus Christ. Mr. Swan, I would greatly appreciate your thoughts on Martin Brecht's 3 volume work on the life of Luther. I apologize for interrupting the sequence of the subject at hand but I wasn't sure where else to post this question. Thank you for your time.